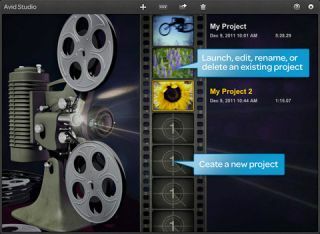 Avid has launched a version of its Avid Studio video editing software for the Apple iPad. The £2.99 app brings a host of the 'prosumer' features associated with the desktop suite and hopes that iPad owners will use it in collaboration with the full suite for Mac and PC. Like Apple's own iMovie software, which launched with the iPad 2 back in March, the software will enable users to arrange and fine-tune clips with frame-by-frame edits. There's also a host of effects and transitions that can be dragged onto clips, while soundtracks can be added from the many built-in options or songs from your iPad's music library. Once you're done with editing the project, it can be exported to Facebook or YouTube and also to the device's camera roll. It's at this point that Avid hopes that owners of the desktop software can benefit from the on-the-go aspect of the app. Once the video has been exported, it can be easily brought in to the Avid Studio for Mac or PC, which brings the full-range of editing and exporting options. "We've seen a shift in how creation is happening, and it's really happening on almost any device," said Avid VP Tanguy Leborgne. "We think the tablet is more than just a consumer device; more and more people are creating on it." The launch of software like iMovie and the more powerful Avid Studio add more weight to Apple's claims that the iPad is a post-PC device. After 30 days of using the Avid Studio for iPad app, you'll need to front-up a couple more quid to continue using it on a full-time basis.